Citation: Almasi M, Rohani M, Soltan Sanjari M, Imani A. 2017. Brain MRI Features in Horizontal Gaze Palsy with Progressive Scoliosis. J Neuroimaging Psychiatry Neurol 2(1): 1-2. Citation: Nestor PG, Niznikiewicz M, Hasler VC, Newell DT, Shenton ME, et al. 2017. Neuropsychology of the Social Brain Hypothesis of Schizophrenia: Symptoms, Personality and MRI Correlates. J Neuroimaging Psychiatry Neurol 2(1): 3-10. Citation: Kumari V, Terca T. 2017. Cognitive Behaviour Therapy for Psychosis: Insights from Neuroimaging. J Neuroimaging Psychiatry Neurol 2(1): 11-19. Citation: Epps CT, Tucker BJ, Fong AK, Allen MD. 2017. Functional NeuroCognitive ImagingTM and Notus NeuroCogsTM: A Novel Use of fMRI in the Assessment of Cognitive Function in Major Neurocognitive Disorder. J Neuroimaging Psychiatry Neurol 2(1): 20-29. 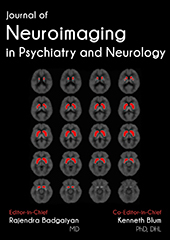 Read our latest issue articles and submit your next manuscript to Journal of Neuroimaging in Psychiatry and Neurology (JNPN).